Since the end of the Renaissance era with Disney's acclaimed Tarzan, the company has been subject to a mixed response from audiences - moronic audiences who only seem to remember crap like Chicken Little and seem to interpret Disney's reputation from such insignificant turds. In actual fact, Disney continues to be awesome; their last two flicks treated us to a fresh take on a classic fairy tale and demonstrated their still stunning ability in traditional animation, and now their latest project abandons the fairy tale premise in favour of something original and equally fantastic: an animated journey into the realm of video games. 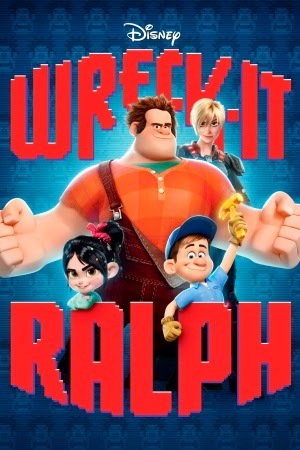 After thirty years of work and neglect in the arcade game Fix-It Felix Jr, bad guy Wreck-It Ralph (John C. Reilly) decides it's time to earn the respect of others and justify his importance in the gaming world and consequently journeys to neighbouring game Hero's Duty to earn himself a gold medal and the praise of others. But when things don't go according to plan, his medal is lost and he is transported to the new game of Sugar Rush and must team up with Vanellope von Schweetz (Sarah Silverman), a glitchy, misplaced character also trying to earn the respect of others, to win back his stolen prize; however, his priorities are soon shifted where a danger Ralph may have inadvertently started begins to unfold, jeopardizing not only the future of his game but the entire arcade itself. Wreck-It Ralph is one of the best animated films ever made when it comes to visuals and this isn't just because of the wonderful quality of the rendering and animation. The films art direction is lovingly crafted to appeal to fans of gaming, with a distinct 8-bit quality to the various retro arcade settings and a host of famous cameos from Sonic the Hedgehog to Pac-Man to Bowser (yeah, Mario was too expensive). It doesn't end there, though - the design of each location in the film is full of careful attention to the backgrounds and background characters, essentially creating one of the best Where's Waldo?-esque games ever created. The film is backed by a strong voice cast thankfully not overrun with unnecessary Hollywood A-Listers: John C. Reilly is hilarious as Ralph, and Jack McBrayer's flamboyant and and pretentious portrayal of Fix-It Felix is just as enjoyable. Some fans will also notice the care and attention to the voices of the cameo characters: for example, Roger Craig Smith reprises his role as Sonic in his relatively small role (look out for his background appearances though!) and Kyle Herbert continues to portray Ryu from the acclaimed Street Fighter franchise. Great stuff! Wreck-It Ralph is difficult to fault; the story comes together like a wonderful jigsaw, though admittedly it can feel a tad contrived in areas. There's a strong heart behind everything and a touching moral to the narrative, and it's all backed by an ingenious premise and fantastic characters. People unfamiliar of the franchises involved in the films various cameos will still enjoy it as a great animated flick, but those engrossed in the gaming universe will be overwhelmed with nostalgia and appreciate it so much more. Wherever you stand, nothing changes: it's brilliant and you should go see it.